The species is distributed in Iran, Asia Minor, and to the east to Afghanistan, and Western Tian-Shan. In Armenia, the subspecies M. p. caucasica Staudinger, 1861 is recorded inhabiting semi-deserts and dry mountain steppes of Central and Southern regions at the elevation range from 900 to 1500 m a.s.l. Among host plants of the species the Plantago lanceolata and Linaria vulgaris are known. The species gives two generations per annum, having butterflies of first generation on wing during May and second generation in mid July to August and sometimes even till early September. The species is rather uncommon within typical habitat, but its population trend during 2003-2013 remains stable (p>0.05). The host plants of the species are usually not a fodder object for livestock, and that factor probably helps the species to survive in intensive grazing conditions. 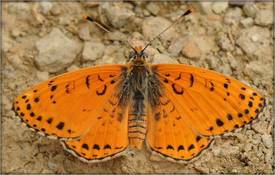 There is some trade of the species, but again not at the level which can influence the Persian Fritillary's population. The species is not included in the Global, European, and National Red Books, as well as in the CITES and Bern Conventions. 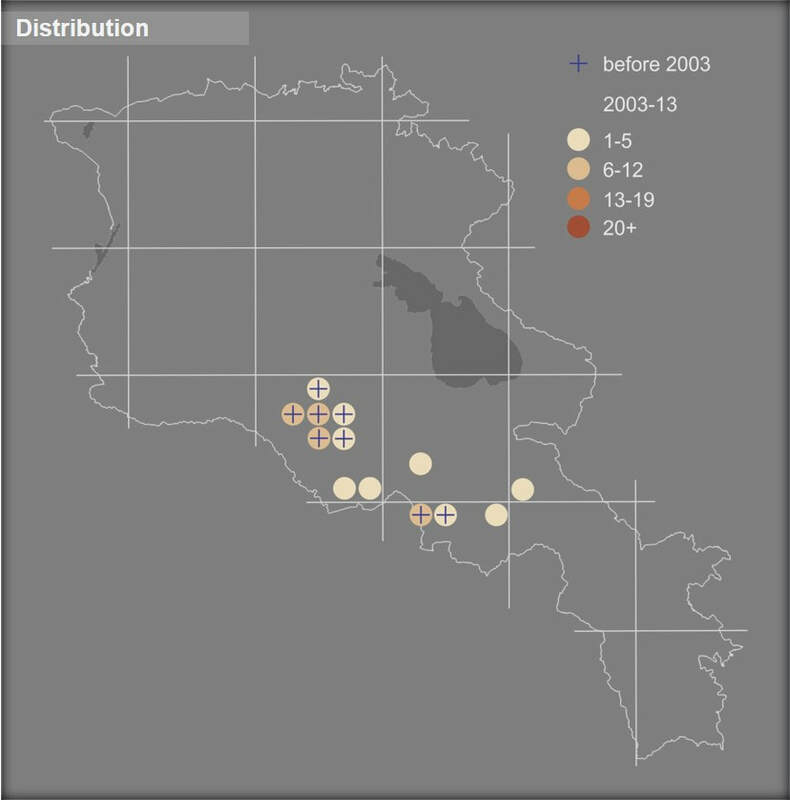 Preliminary assessment of the species' conservation status in Armenia ﻿﻿​suggests it as Least Concern. The current distribution of the species is covered by Khosrov Forest State Reserve and Gnishik Protected Landscape and the appropriate Emerald Sites; also the species is presented in the Prime Butterfly Areas Gnisheek and Ourtsadzor. At current there is no need for additional conservation measures for the Persian Fritillary to be developed, however it is important to continue its monitoring in frames of general scheme. The species is one of the target objects for butterfly-watching and therefore can be used for marketing butterfly-watching tours and particular Prime Butterfly Areas.